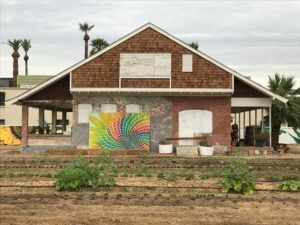 True North: Preserving History, Enhancing Downtown Phoenix Culture – Artworks PHX – a business-arts campaign in Phoenix, Arizona USA. True North Holdings is a development company located in the heart of downtown Phoenix, within the iconic monOrchid Creative Studios on Roosevelt Row. Far from a conventional real estate development company, the people behind True North care more about creating meaningful developments that blend into and add to their surrounding urban context. 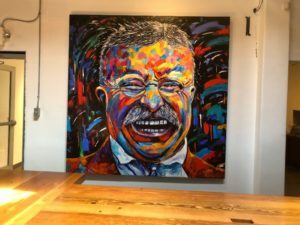 The company is infusing community, art, and historic preservation into its development projects, as seen in a colorful, commissioned painting of former President “Teddy” Roosevelt looking over True North’s workspace at monOrchid Creative Studios, to symbolize the local Phoenix “Roosevelt Row” arts district location. True North is developing Ro2, a mix of commercial and residential property, including major historic presentation of the Leighton G. Knipe House built in 1909, located at 1025 N. 2nd Street, along with new projects located on two adjacent parcels at 1009 and 1016 N. 2nd Street. 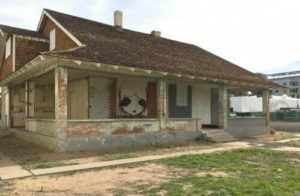 The properties are located in the Evans Churchill Neighborhood and the Roosevelt Row arts district of downtown Phoenix. The development includes a four-structure project with 305,000 square feet of commercial office space to be located within a 19-story high-rise, as well as 77,000 square feet of retail space. That plan also includes 32 residential units and 1,200 parking spaces. Architectural plans were created with help from local architects who specialize in historic preservation. Ro2 aims to provide the highest and best use for the community and the positive-trending Phoenix market. True North team is excited to implement environmentally and socially sustainable practices throughout the Ro2 development. Key members of the team are experienced in implementing various innovative design elements that improve the liveability and long-term sustainability of neighborhoods, while improving public health, safety, and environmental stewardship. 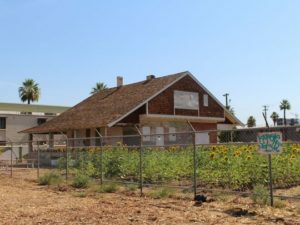 For example, Growhouse, an urban garden, located at the Knipe House property, will continue operations as a tenant. Utilizing the input from working committee meetings, downtown design guidelines, and neighborhood initiatives, Ro2 strives to provide significant public and economic benefits for the Roosevelt Row Arts District and downtown Phoenix. The True North team is driven to make Ro2 an iconic development that builds on the character and feel of the Roosevelt Row Arts District. Jonathon Vento, the company’s Principal Developer, and Development Manager, Ryan Kerr, have worked diligently to ensure a participative, robust community input process, inviting residents and stakeholders to weigh in on plans and provide ideas to guide the development. Jonathon and Ryan emphasize a holistic approach to infusing art into their projects, to showcase both local and international art throughout the developments, beyond simple architectural design, from artistic expressions of shade to refined culinary art forms populating the buildings. They aim to add world-class arts and culture assets that create long-term value and both local and international intrigue.